A landmark, eclectic, leviathan-sized anthology of fiction's wilder, stranger, darker shores. 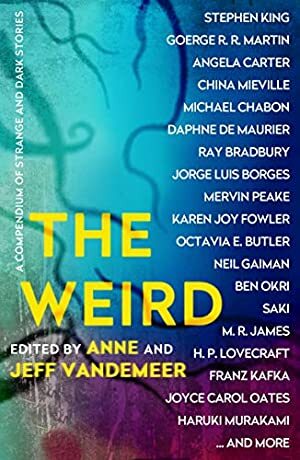 Exotic and esoteric, The Weird plunges you into dark domains and brings you face to face with surreal monstrosities; You will find the boldest and downright most peculiar stories from the last hundred years bound together in the biggest Weird collection ever assembled. Log In to track Jeff VanderMeer on eReaderIQ. to be notified each time the price drops on any book by Jeff VanderMeer. to stop tracking Jeff VanderMeer. We started tracking this book on December 19, 2011. This book was £12.38 when we started tracking it. The price of this book has changed 54 times in the past 2,684 days. This lowest price this book has been offered at in the past year is £0.98. The lowest price to date was £0.98 last reached on October 5, 2018. The highest price to date was £17.99 last reached on January 9, 2018. This book has been £17.99 one time since we started tracking it.